Our analysis of Just Cause 3 across all platforms. From a technical standpoint, Just Cause 3 is one of the most impressive games we have seen running this generation. Sure, there have been the likes of The Witcher 3: Wild Hunt and Metal Gear Solid V: The Phantom Pain but the amount of stuff that is being rendered in Avalanche’s over the top action adventure game is beyond ridiculous a times. Before we jump into analyzing the performance across all three platforms, we wanted to talk a bit about the Avalanche Engine and how the developers have updated its destruction framework. Back during Just Cause 2, the developers used a technique called as mesh swapping which allowed the engine to carry out limited destruction and swap the end effect with a static simulation. In simpler terms, the destruction in Just Cause 2 was not completely dynamic. However the destruction framework in Just Cause 3 is coupled with Havok’s set of solutions which allow the designer to build each destructible object with a set of sub-objects allowing for a more realistic simulation. Designers have more control over the destruction algorithm but this also means that the man-hours invested increases exponentially. Not everything is destructible in Just Cause 3 but what can be destroyed is truly a sight to behold and most of the times, the sub-particles obey the law of physics…although things can get awry at times. What puts us in awe every time we played Just Cause 3 was the scale of destruction. Seeing massive objects such as fuel tanks and towering satellite dishes explode never gets old. Talking about the console versions, the PS4 version runs at 1920 X 1080p resolution compared to 900p resolution on the Xbox One. Due to this, the Xbox One suffers from inferior image quality compared to Sony’s console. Both versions use a form of a custom post processing anti-aliasing solution and the results are mixed. Jaggies can be seen across the world, and it’s especially jarring when we see it on water surface. It seems that water tessellation solution is clashing with the post processing AA solution resulting into an uneven rendering although we are not sure about this. Jaggies are more apparent on the Xbox One version due to its lower operating resolution but overall, we are not impressed with whatever custom solution Avalanche is using for smoothening the edges. The core assets such as texture quality are one to one across both platforms with both versions suffering from shadow dithering with some form of ambient occlusion applied in some places. Head to head comparison between PS4, Xbox One and PC versions. Select 1080p and 60fps for best possible video playback quality. Draw distances and texture filtering, too, are similar on both the PS4 and Xbox One but it unfortunately suffers on the latter resulting into loss of details when observed closely. 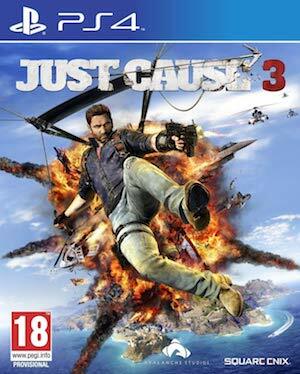 Just Cause 3 on consoles operates at a 30fps cap and although the engine does its hardest to maintain consistent performance, drastic drops can be witnessed especially during explosions. The engine literally struggles to maintain 30fps during these scenarios but given the technical ambitions that Avalanche Studios were aiming for, it’s no surprise that the CPUs of PS4 and Xbox One struggle to handle this level of physics simulation that Just Cause 3 utilizes. Surprisingly, the Xbox One holds itself better during such sequences but on a broader level, the performance is more or less same on both consoles. The game’s engine uses a procedural system of loading certain assets. For example, the ground textures’ loading/un-loading depends on the field of view of the player. It’s not completely distracting and serves as a method for saving up memory. Now let us shift our focus on the PC version. We were pretty excited to get our hands on the PC version given that Just Cause 2 ran extremely smooth on the world’s biggest gaming platform. In terms of graphical settings, Just Cause 3 does not disappoint. The game comes packed in with several options such as Water Detail, Water Tessellation, better AA solution, Global Illumination and detailed Screen Space reflections. Running the game on an Intel Core i7-5960X with 16 GB of RAM, we tested the game with a GTX 980 Ti. This is obviously more than the recommended settings and we had no issues running the game at Ultra Settings. However there were a couple of oddities we noted. The asset streaming issue that is present on the console version is also visible on the PC platform, although it’s less frequent. We also witnessed pop in issues while gliding or driving a vehicle, although it’s less compared to the console versions. Performance wise, we faced no issue except a few drops during the explosive sections of the game. Even at the lowest settings, the game looks decent. By our approximation, the console versions are equivalent to the high settings of the PC version. It will be interesting to see how Avalanche Studios improves the performance of the console versions. They also need to improve the drastic loading times. We are assuming that future patches will fix the performance issues but for now, PC is the best way to experience the studios’ fantastic open world action game.